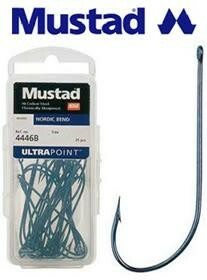 The Mustad 4446 is now a classic all round light wired shore fishing hook for general clean ground fishing. They work well with a variety of baits and are a good pattern for whiting, flatties, codling etc. The 4446NPB has a slightly kirbed special bend, micro barb and chemically sharpened Ultrapoint. The small eye allows the use of quite delicate baits.